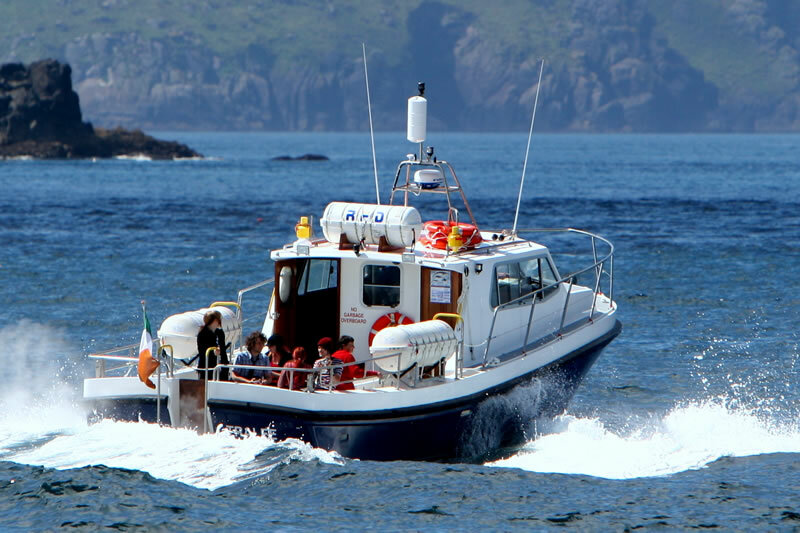 “Blasket Princess” is a Class VI purpose built vessel complying with all current Department of Marine standards; with Passenger Certificate for 44 passengers and 2 crew, and inside seating for 20 passengers. The boat complies with all S.O.L.A.S Safety, Fire-fighting and Communication Regulations and has an extensive range of electronic equipment. The boat is powered by a pair of John Deere 220 h.p. marine diesel engines (“nothing runs like a deere”). There is a flying bridge for passengers to view sealife when the boat is stationary / calm conditions. Your Captin Michael ("Mick") Sheeran has all the relevant Department of Marine qualifications and Commercial endorsements and has over 30 years experience fishing/ferrying/sailing in these waters. He has brought in excess of 100,000 people to the Great Blasket Island in Safety over more than a twenty year period. His intimate knowledge of the Blasket Sound is based on his years when he lived and fished from the Great Blasket Island and rowed across to the mainland many times by namhóg (curragh/canoe).